It’s no longer President Donald Trump and his allies saying “no collusion.” Special counsel Robert Mueller apparently has reached the same conclusion that the Trump campaign did not conspire with Moscow to gain advantage in the 2016 election. Mueller also did not uncover actionable evidence that President Donald Trump sought to obstruct justice by impeding the probe, Attorney General William Barr said Sunday. When departing Sunday afternoon from Florida to return to Washington, Trump spoke for the first time since the report was delivered Friday, noting that many people were “so badly hurt” in the course of the probe. It’s a shame that our country had to go through this. To be honest, it’s a shame that your president has had to go through this. Before I even got elected it began, and it began illegally. And, hopefully, somebody is going to look at the other side. This was an illegal takedown that failed. And hopefully, somebody is going to be looking at the other side. It was complete exxoneration. No collusion, no obstruction. Barr, in a letter to members of Congress, said Sunday that Mueller concluded that after his investigative team of 19 lawyers and 40 FBI agents conducted 500 interviews, issued 2,800 subpoenas, and executed 500 search warrants. Rosenstein appointed Mueller in May 2017 because Attorney General Jeff Sessions had recused himself from overseeing the FBI’s initial probe. Republicans and Democrats want to see as much of the special counsel report on Russian election interference made public as possible–but for different reasons. The Steele dossier, named for former British spy John Steele, who compiled it, was financed by Democrat Hillary Clinton’s presidential campaign and by the Democratic National Committee. The contents of the Mueller report remained unknown Sunday to all but Barr and a few other Justice Department officials, but reportedly does not call for any more indictments in the investigation of Russian meddling in the 2016 campaign. 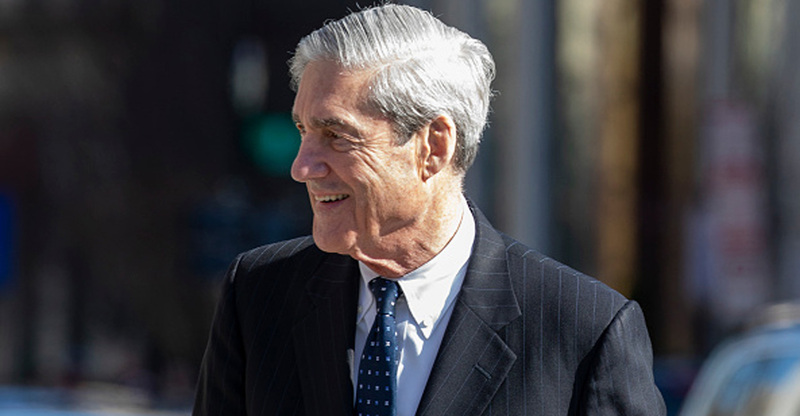 Mueller’s 675-day probe officially ended Friday, when the special counsel delivered his report to Barr at the Justice Department. Barr, who took office last month, indicated he might be able to brief some members of Congress on the report Sunday. Under Justice Department guidelines designed to protect those who are not charged, the entire report cannot be made public, consistent with other criminal investigations, said Hans von Spakovsky, a former Justice Department lawyer. “I never said I thought the president committed the crime of conspiracy,” Schiff said. The post Attorney General Sees No Case for Obstruction as Mueller Finds No Collusion With Russia appeared first on The Daily Signal.